In a major act of censorship, the Pakistan government enforced a blanket blackout of news and current TV channels as well as a shutdown of several popular social media platforms spread over November 25 and 26, 2017 in an attempt to prevent media coverage of political protests and access to information online. The shutdown included 24/7 current affairs and news channels on cable network, Twitter, Facebook, YouTube sites for 28 hours to clamp total blackout of information hours after police and other law enforcing agencies began a security operation on November 25, 2017 – against supporters of a religious group demanding resignation of a federal law minister over blasphemy charges. “State enforced mass censorship and cutting off access to sources of information is unacceptable as it infringes on constitutional guarantees of the right to freedom of expression and access to information,” Freedom Network, the Pakistan-based media watchdog said on November 27, 2017 in its #PressFreedomAlert. With a deal struck between the protesting group and the government, it looks that perpetrators of crimes against journalists will go unpunished. “Letting these perpetrators go scot-free will reinforce impunity for crimes against journalists and media houses,” the #PressFreedomAlert reiterated. Over a dozen of journalists were reported attacked while covering sits-in of these supporters of the religious group in Rawalpindi city near Islamabad and Karachi city. “About 15-20 protestors were involved in beating me up,” Yasin Hashmi, reporter for Business Plus channel said in his audio message. The journalist received eight stitches in his head. Rawalpindi-Islamabad Union of Journalists said received unconfirmed attacks on nine journalists. They included Qamar Mansoor of Dunya News, Sadam Mangat of Channel 24, photographer Tanver Shahzad of daily Dawn newspaper, Yasin Hashmi of Business Plus, photographer Pervez Aasi of Metro Watch, photographer Zulfiqar Zulfi, Sultan Shah of Aab Tak TV and Shiraz Gardezi of Geo TV received. In Karachi, senior journalist Tariq Abul Hasan of Geo News channel, was attacked when he was covering sit-in of supporters of the same religious group. The PEMRA notification ordered channels to abide by Clause 8 (8) of the Electronic Media (Programmes and Advertisement) Code of Conduct 2015, to show “utmost sensitivity” and refrain from coverage of the operation. It issued guidelines for media to follow while covering “security operation” and blamed media for ignoring these. Pakistan faced such situation after 10 years when former military ruler imposed emergency in 2007 shutting down news channels and banning online social networks. Only WhatsApp was working to let public get information about security situation arising out from the operation about the Islamists from each other. Pakistan Federal Union of Journalists (PFUJ) denounced the government action to clamp complete information black hole across Pakistan. “This is a draconian order and very much the violation of Article 19 A of the Constitution,” Ayub Jan Sarhandi, the secretary general of the PFUJ, said in a statement. In Islamabad, RIUJ arranged protest demonstration to condemn blackout of information by taking news channels off cable networks across Pakistan and denying public access to Twitter, Facebook, YouTube. 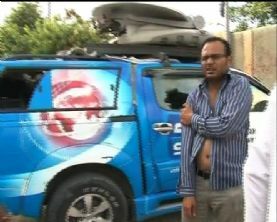 Angry supporters of the religious group also attacked DSNG vans of Aaj News and Samaa News channels and damaged badly.